Independent oil explorer/driller in the old days. Non-standard cartridges. 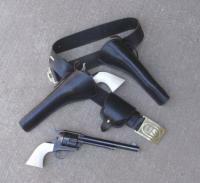 Ruger baby Vaquero (Single Six) in 32 H & R.
Mernickle is good people and he builds good leather. Chinese made 12 ga hammer double SG, not fired very much, $250. between the wars historical note: Bonnie and Clyde used BARs, not Thompsons. Sounds kinda like "Once Upon A Time In The West". Day is done. Gone the sun. I'm gonna call a second miss on this one. The rifle kd wasn't there because the shooter knocked it down when he shot the wrong target. Therefore the "missing" target was caused by the shooters own actions. There was no target failure. And yes, self inflicted wounds are the most painful.